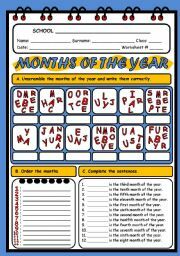 SS UNSCRAMBLE THE MONTHS OF THE YEAR, ORDER THEM AND COMPLETE THE SENTENCES. 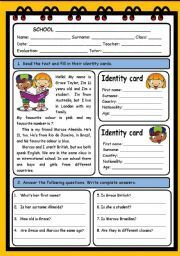 SS MATCH THE COUNTRIES WITH THE NATIONALITIES; THEY WRITE THE NATIONALITIES ACCORDING TO THE SUFFIX; THEN THEY ORDER SENTENCES, WRITE ABOUT ORIGIN AND NATIONALITY AND COMPLETE THE QUESTION-TAGS. 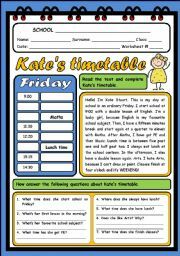 SS READ THE TEXT, COMPLETE KATE´S TIMETABLE ACCORDING TO THE INFORMATIONS AND THEN THEY ANSWER SOME QUESTIONS. 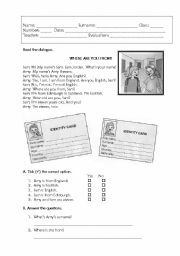 SS READ THE TEXT, FILL IN ID CARDS AND ANSWER SOME QUESTIONS. THEN THEY COMPLETE SOME GRAMMAR EXERCISES (TO BE, PERSONAL PRONOUNS) AND FINALLY THEY WRITE A LETTER TO A PEN FRIEND. 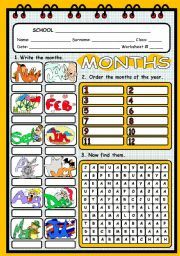 SS WRITE THE MONTHS, ORDER THEM AND FIND THEM IN THE WORDSEARCH. 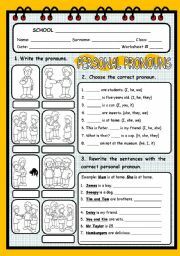 SS CHOOSE THE RIGHT PERSONAL PRONOUNS, COMPLETE SENTENCES AND WRITE SOME SENTENCES. WHAT DID THEY DO YESTERDAY? SS REVIEW THE RULES OF PAST SIMPLE OF REGULAR VERBS. SS REVIEW THE DAILY ROUTINE VOCABULARY. SS SPIN THE WHEEL AND MATCH THE RIGHT WORD. 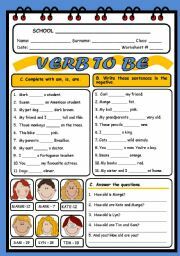 THIS IS A MULTIPLE CHOICE GAME - VERB TO BE. 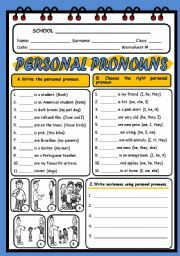 SS REVIEW THE PERSONAL PRONOUNS.